For the Koovs's fourth task, we had to dress ourselves in one of the themes given, and then design a page for Grazia, thus featuring ourselves and helping our 'readers' to 'get the look'. 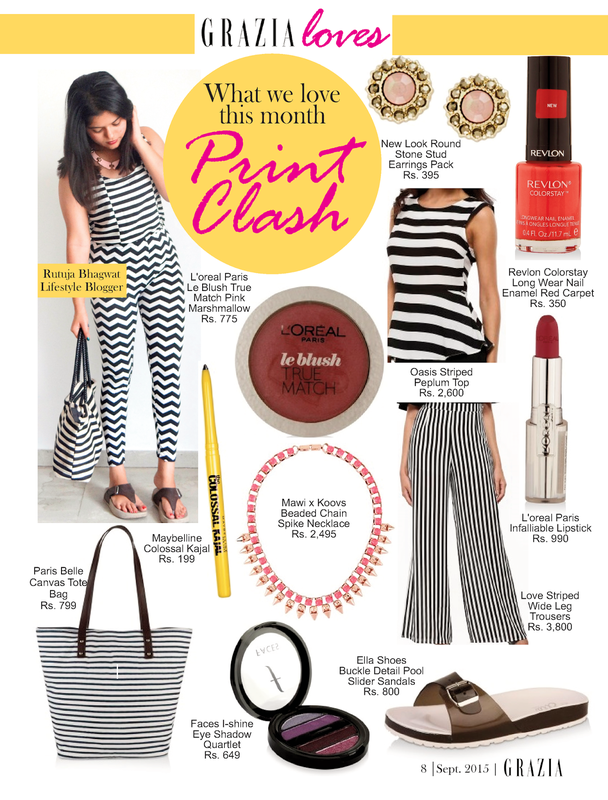 So, I chose 'Print Clash' as my theme, in which I had to wear print on print. The only thing that comes to my mind after talking about printed bottom wear is my chevron striped leggings. So I chose that, and for the upper body, I chose a striped loose vest. I shot the photographs in Pune and then designed the page after coming back to Mumbai. Unfortunately, QuarkXPress was deleted from my PC and hence, I had to download it again. To my surprise, I remembered each and every command, and the shortcut keys too! Maybe, if you do something out of total love, you necessarily don't need to 'remember' its functioning; all you have to do is initiate your work and your hands start moving automatically! I'd thought I'd forgotten the essence of designing a magazine, but I'm happy to know I hadn't. Last year, for Newspaper and Magazine Designing project, I had designed a magazine. I referred a particular page of that magazine for this task. I am delighted to design again, after a year! Have you ever tried designing a magazine or a newspaper?